No doubt many of you will have heard the sad news that singer of Soundgarden and Audioslave, Chris Cornell passed away sadly yesterday. At the age of 52 it’s a huge surprise and shock to the Metal community so we thought the least we could do was remind everyone of just how influential a man he was. Going up against the fierce competition of the classics the likes of “Goldeneye” and “Thunderball” you could have forgiven Cornell for being somewhat nervous when it came to recording his bond song “You Know My Name” for Casino Royale. Instead Cornell rose to the challenge giving Rockers and Metalhead’s alike a little Easter egg before the film started. Bellowing out the chorus with his signature vocal style, it was here that the man’s voice was so commanding. Surely a finest hour in the sadly short life of our Audioslave hero. An anthem for a doomed youth, “Black Hole Sun” amongst having one of the strangest videos out there was an absolute scorcher of a single. Showcasing all the elements that Soundgarden had become notorious for, the track dominated Kerrang! TV screens and you could argue was one of the most influential in the Grunge movement. It’s also the kind of song you could play anywhere and people will sing, not to mention get it stuck in your head for days and days! I remember being younger, seeing the fireworks or flares at the beginning of “Cochise” and thinking “This looks interesting”. After a drawn out intro of signature Tom Morello nature, THAT riff comes blistering out. With all the swagger in the world, the riff as good as it may be, would never have been as good had the band not had Chris Cornell! 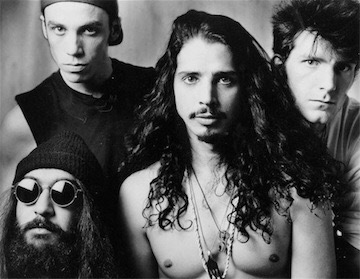 After the demise of Rage Against The Machine there was the birth of Audioslave, many calling it an amalgamation of Soundgarden and Rage, it was clear later on however that Audioslave was just as genius as the two of the bands put up against. I was fortunate enough to have been able to see Soundgarden after they had reformed. Missing the initial birth of Grunge, child of 91 here, I was somewhat behind the times. Now I know how lucky I was to be able to see the band as main support before Black Sabbath‘s performance at Download some years ago now (2012?). I had never really GOT Soundgarden up until that point but after that performance I was absolutely gobsmacked at the man’s singing ability. There was absolutely no question why he wouldn’t be one of the forebears of Grunge. Sadly we only have the memories now. Somewhat reiterating what I have said previously, Chris Cornell was simply made for music. A man whose destiny was the stage. Understanding his sheer ability, creative influence and understanding of the band dynamic, he was everything that you wanted in a front man. Powerful, modest yet teetering on arrogant when needed but most of all a lovely human being. Our thoughts go out to all that have been affected by the man’s death, in particular of course his family.